Most surviving scientific instruments are made of metal - a robust material for practical and portable devices. 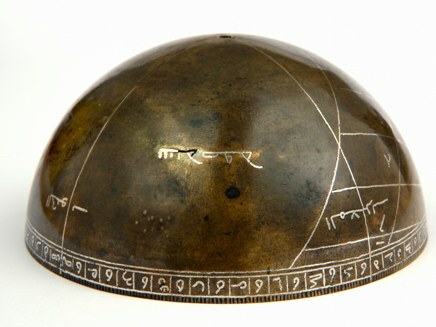 Brass was the preferred material for many utilitarian vessels and utensils, and its suitability for engraving made it ideal for the lines and inscriptions on astrolabes and globes. From the 12th century onwards the technique of inlay became particularly popular across the Islamic world. Silver, gold or copper was hammered into the surface of brass to create a brilliant decorative surface. Brass was transformed from a workaday material to the status of a prized luxury commodity. The manufacture of an astrolabe required much the same equipment and skills as other forms of metalwork. This close connection is underlined by similarities in decoration: a prestigious instrument would feature the decorative styles encountered in other forms of metalwork.